Apple iPad 3 prices, storage to stay the same: $499 for the basic 16GB model? The Apple iPad 3 is just a couple of days away from getting unveiled, and recent troublesome rumors claimed that it will cost more than iPads have cost so far. 9to5Mac counters that claim as it got information that both pricing and capacity of the new iPad won’t change. This means that the iPad 3 will be available in the same 16GB/32GB and 64GB versions with prices starting from $499 for the Wi-Fi-only model. Good, Better and Best seem to refer to the storage capacity, while the J1 and J2A are indicators that should differentiate the iPads by either connectivity or less likely color. 9to5Mac’s source, Mr. X, has been mostly right about his predictions. He gave out the 64GB iPhone 4S news a couple of days before Apple made it official. He’s also had some misses, though, so we’d still take this with a slight grain of salt. There’s no word on whether 4G LTE will be included and that’s the single biggest question that we expect Apple to answer on March 7th at the official unveiling of the tablet. Except for that, most sources agree that the new iPad will have a stunning resolution of 2048x1536 pixels, a faster processor and improved camera. It’s also possible that it will have more RAM memory. Hey 'Blue', Those "a's" should be cApitAliZed; please use proper krApple grAmmAr. In line with the iCrap, iCrappier and iCrappiest theme, this week's announcement will be for a modest bump up in processor speed - the A5X chipset with 2 cores, faster clock rate and improved GPU function in addition to the retina display. Those iFans wanting quad cores will have to wait until September when the iPad 3S launches in time for the 2012 holiday shopping season. You heard it first on PA..... Sorry iFans. 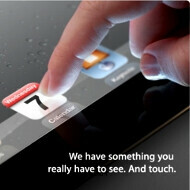 Is iPad 3 have microSD slot 64gb capacity? Yes it will, but only when you connect it via iTunes. It will also come in pink; in honour of the Apple iFairies. You are iNcorrect, SiR; not 'most', they all have expAndAble memory. No, no you can haz no extras memoreez. AHAHAHAHAHHAHAH....oh that's cute...expandable memory or any interchangable parts on an idevice, I needed a laugh today, thanks for that! I know your statement is false-to-fact because you haven't any friends. 'hahaha'...........ha-ha-ha-ha!! Is there any ways to switch the fools day to March 7? $499 for a tablet without a micro sd card slot that costs around $80 to make... And still the iSh**p will camp outside in subzero temperatures to get one.